S-CUT is developed by rescue staff and is used by rescue- and ambulance services all over the world. An S-CUT provides a fast and safe way to remove clothes and boots, to cut car belts and more in accident situations. We have also developed an S-CUT model for those who are in need of an excellent cutting tool that works in though conditions, S-CUT X-treme Cutter. The model is commonly used by horse owners, a horse stuck in a lead rope or fence wire often end up in panic and could seriously injure itself trying to get free. 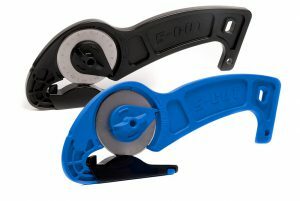 With an S-CUT available you can easily cut leather straps, ropes and fence wire with one single grip. The X-treme Cutter is also used on boats, by hunters and for tasks at home when you need a sharp cutter. S-CUT saves lives of both humans and animals! S-CUT QE in black and blue. There is also a simplier model available for you who are in need of an efficient cutting tool by certain occaisions. The S-CUT QE (Quick and Easy) model is an allround cutting device for those who need to cut through different materials, almost everything but metal. With amazing cutting capability you can easily cut heavy leather belt, tarpaulin or ground cloth. The standard colors of the QE-model is black and blue, but by ordering larger volumes you can pick other colors. Please contact us for furter information. In our broschure you can read about the CE-marked S-CUT models and how they are used in real situations.